Anyone who has tried to slim down can tell you: there’s no simple solution for shedding pounds. Habits like eliminating whole food groups aren’t a healthy way to lose weight, and certainly aren’t a long-term solution for keeping belly bulge at bay. Worst of all, these misconceptions cause frustration—and maybe some serious damage to your health. So, it’s time to separate fact from fiction. Here's the truth about some of the most common weight loss myths, plus proven ways to actually shed pounds. Fats have gotten a bad reputation, but you don’t have to eliminate them from your diet to lose weight. In fact, a Harvard meta-analysis of 53 studies of more than 68,000 people compared the effectiveness of various diets and resulting weight loss over the course of a year or more. Researchers found those on a low-fat eating plan weren’t particularly successful in shedding pounds and keeping them off. What's more, replacing your favorite eats with low-fat versions could introduce unhealthy additives into your diet. “When they remove the fat, they have to replace it with something else, so often low-fat products are filled with a lot of sugar and sodium,” Baranowski says. Avoid these unwanted additions by choosing healthy fat sources, like olive oil, salmon, avocado and walnuts. Not only can these good-for-you fats help improve heart health, they also won’t likely cause weight gain. Just don’t overdo it. Foods rich in healthy fats tend to be higher in calories, so mind your portion size when cubing avocado or sprinkling nuts into your lunchtime salad. There’s no shortage of low-carb diets on the market, from Atkins to South Beach and beyond. These plans often aid in short-term weight loss, but seldom lead to long-term results. A meta-analysis of five studies found that, after six months, people on low-carb diets lost more weight than people on low-fat diets. However, by 12 months, there was no difference. “Everybody is afraid of carbs, and I think that's sad because carbs are so important to our health, and they taste good, too,” Baranowski says. It’s true—some carbohydrates are better for our bodies than others. Naturally occurring carbs, found in fruits, vegetables, grains, legumes and seeds, should be a part of a healthy diet. In fact, dietary guidelines suggest between 45 and 65 percent of your daily calories come from carbohydrates. So, load your plate with these, and avoid refined grains like white rice, as well as foods with added sugars, like baked desserts and candy, which are packed with calories but low in nutrition. Not all foods are as effective for weight loss, even if they contain the same number of calories. Your diet affects your metabolism, so where your calories come from makes a difference. Sugar-rich foods, like cakes and cookies, can cause a spike in your blood sugar, a signal to your body that it should hold onto more fat. This isn’t a good thing for those looking to slim down. Instead, fuel your body with lean protein, fresh produce, whole grains and a moderate amount of healthy fats. There’s more. A candy bar and an ounce of raw almonds, for example, contain about the same number of calories, but the nuts, loaded with healthy fats, will likely keep you fuller, longer. Avoid unhealthy grazing, which can lead to weight gain, by making wholesome, filling snacks your first choice. And to prevent a trip to the vending machine for an unhealthy snack with the fewest number of calories, try planning and preparing healthy meals and snacks to eat throughout the day. “Planning ahead and setting yourself up for success is so important," says Baranowski. "So, take a few minutes every weekend to think about and plan your meals for the week." Gluten, a protein found in grains like wheat, barley and rye, has received a lot of attention in the last few years. Gluten-free diets were created as a way to manage symptoms of celiac disease, a condition that causes inflammation of the small intestine and can lead to symptoms ranging from irritability to severe abdominal pain. Those with a sensitivity to gluten, a condition that has similar symptoms but doesn’t damage the intestines, can also benefit from avoiding gluten. However, gluten-free diets have been adopted by people without these conditions. Why? Some cut the stuff because they think they are intolerant, while others swear off gluten in an attempt to drop pounds. But research suggests gluten is not likely the cause of your bulging belly—and there’s no direct link between eliminating gluten and losing weight. In fact, gluten-free products are often full of calories and fat—not conducive to slimming down. What’s more, some healthy whole grains contain gluten, and avoiding them can deprive your body of good-for-you nutrients, like protein. “I would just say, as a general takeaway, anything that eliminates an entire food group just won't work,” Baranowski says. “So, I would avoid eliminating entire food groups, and anything too restrictive; it's not going to have long-term success,” she adds. As soon as we commit to a diet, many of us pledge to give up unhealthy foods, even those nibbles we love most. Don’t be so quick to break up with your favorite takeout order or bakery staple, though. “Anybody who feels deprived is not going to be successful in managing their weight or leading a healthy lifestyle,” Baranowski says. The key to losing weight is consuming fewer calories than you burn. 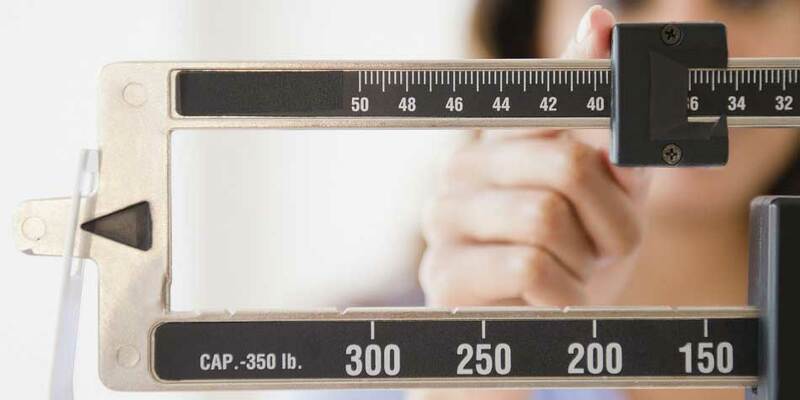 It’s possible to fit well-planned snacks, and even the occasional unhealthy indulgence, into a healthy weight loss plan, but you need to keep track of the calories. Research suggests those who log their daily calories are more successful at losing weight than those who don’t. Work with your dietitian or doctor to determine how many calories you should be eating to slim down, and keep a log of the foods and drinks you consume. Food scales are an inexpensive way to measure portions before loading your plate, and phone applications make logging calories convenient. A handy notepad or even a kitchen napkin will even suffice as a food journal.